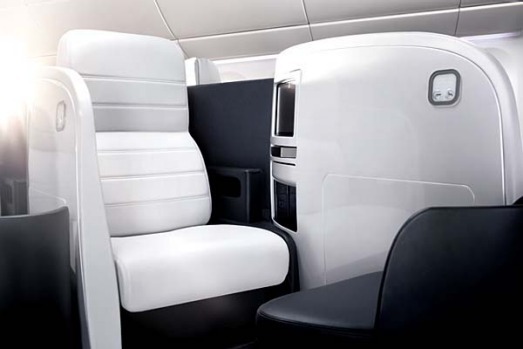 Air New Zealand's new premium economy seat design, the 'Spaceseat'. The Skycouch footrests lock into position to create a flat surface passengers can stretch out on. The Skycouch seats set in a normal seating position. 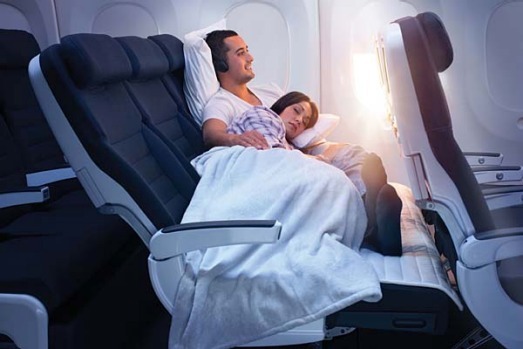 The middle row of premium economy seats is designed for couples. 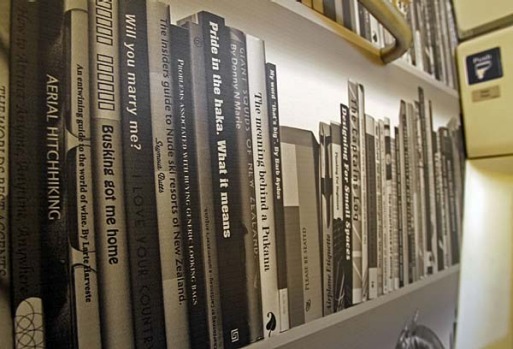 Couples may find the Skycouch a bit of a squeeze. 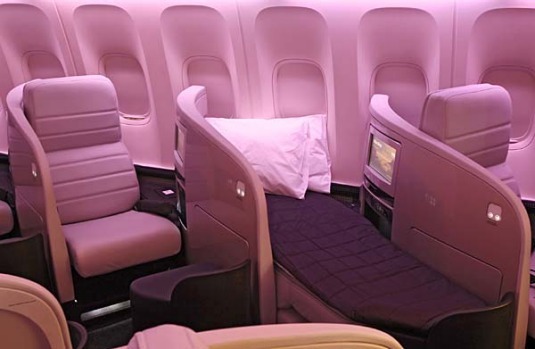 The Skycouch will not replace business class flatbeds, as it is only the length of three economy class seats (about 135cms). The Skycouch could be a godsend for parents travelling with small children on long-haul flights. 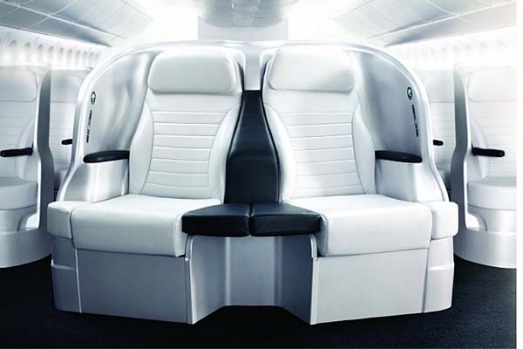 Air New Zealand's radical new economy seat design - the Skycouch. 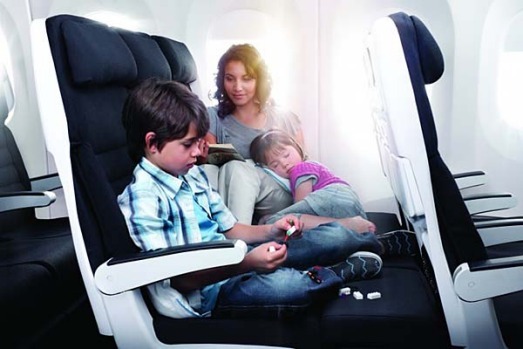 Air New Zealand's new premium economy class. 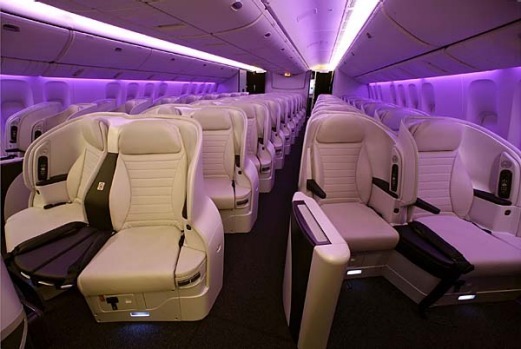 Air New Zealand's business premiers seats. 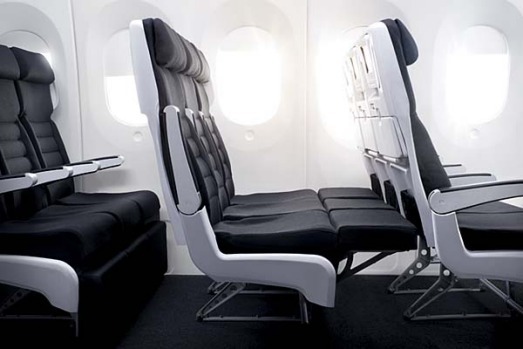 Air New Zealand's business premier class seat. 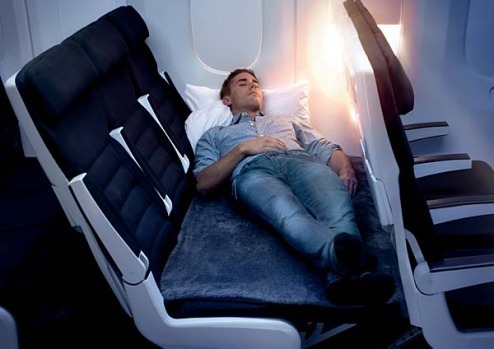 Air New Zealand's business premier class seats fold over to create a long flatbed. 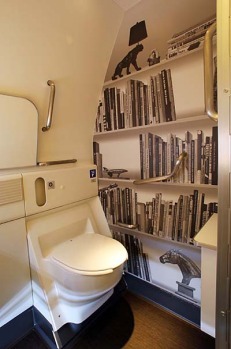 The toilets on board the Air New Zealand Boeing 777 feature fake bookshelves and chandeliers. A trans-Pacific flight in Air New Zealand's "cuddle class" is bound to get you hot and sweaty - maybe just not in the way you hoped. There's no doubt the airline's new Skycouch is an improvement on regular economy seating. 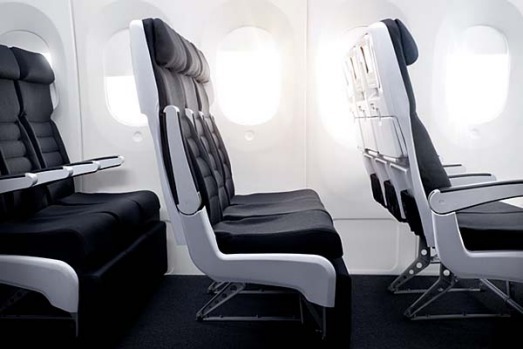 Its lie-flat space is designed to give long-haul passengers a break from sitting bolt upright. However, the couch is also a tight fit. And while enforced snuggling with your one-and-only is usually a welcomed opportunity, the small space combined with fully clothed passengers, warm blankets and cabin heating make for some pretty sweltering spooning. 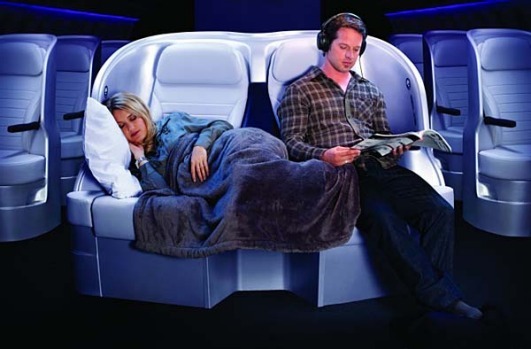 So hot right now ... spooning can get a bit heated on Air New Zealand's SkyCouch. The Skycouch, dubbed "cuddle class", has been claimed as the biggest development to airline seating in 50 years, and has just won the aviation category of Condé Nast Traveller's 2011 Innovation and Design Awards. 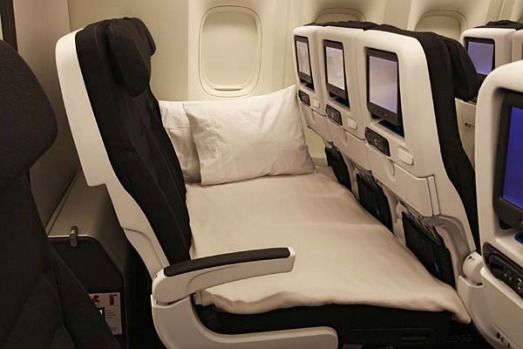 It came into operation earlier this year on flights NZ1 and NZ2 - Air New Zealand's new Boeing 777-300ER aircraft which fly between Auckland and London, via Los Angeles. It is created by using the footrests from three adjoining seats in a window row to create a flat area. A thin mattress is then added along with seatbelt extensions and pillows and voila - the seats become a mini-bed. But it's important to remember that the Skycouch is not really a bed. True lie-flat beds are up in business class, and the couch is still economy in another configuration. Given its cosy confines - the couch's dimensions are 155cm long and 74cm wide - there are bound to be comfort issues for full-sized passengers. A major one is the heat factor. Travelling pressed together for any amount of time is going to generates extra warmth, and sleeping when you're too hot is not pleasant. Also, anyone taller than 154cm will struggle deciding what to do with their legs, while those who are "big boned" may have to take turns lying down to avoid getting squashed. Men, in particular, may also be uncomfortable, as their arms or laps are relegated to serve as pillows for the duration of the flight. 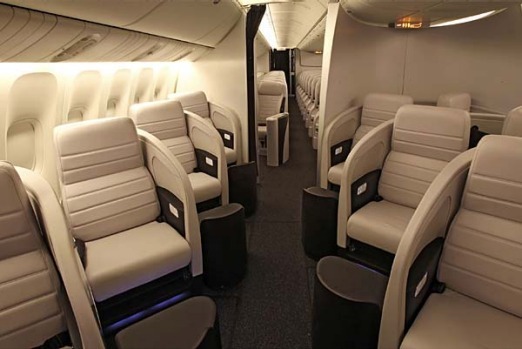 And while the seats offer slightly more privacy than sharing with strangers, it's still not the place you'd choose to join the Mile High club. So while the Skycouch may not be everything a loved-up couple dreams of, it's absolutely perfect for families. On our 13-hour flight to Los Angeles, there were several parents with small children making the most of the Skycouch experience - astounding even the seasoned flight staff with novel ways to use the space. Some created individual couches for the children while they enjoyed the shiny new entertainment system - which includes a USB port for your laptop or iPhone - while others lay down as soon as the lights were dimmed. One family of four managed to fit both parents and two children on the couch and, astonishingly, all were able to sleep. As a couple, we got about five hours' sleep during the flight. We were pretty happy with that. However, our Skycouch was provided free. Paying customers are charged about half as much again for the extra seat, and about $NZ200 ($A150) extra per flight for parents travelling with children. So our extra seat would have cost $NZ300 ($A225) each. Was it worth it? I'd say yes - if only we could have travelled in our underwear.